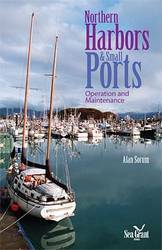 Harbormasters at small ports, especially in northern regions, will find this book invaluable in the day-to-day operation and long-term maintenance of their harbors. The chief difference for northern harbors is the need for more robust structures built to withstand the severe climate. Topics include maintenance planning, repair and maintenance techniques, conducting inspections, creating a resource library, construction materials, harbor and port structures, effect of the environment on materials and structures, hazardous materials, utilities, harbor economics, and safety. Author Alan Sorum is port director in Valdez, Alaska.